Try out a classic tonight with Easy Potatoes au Gratin. 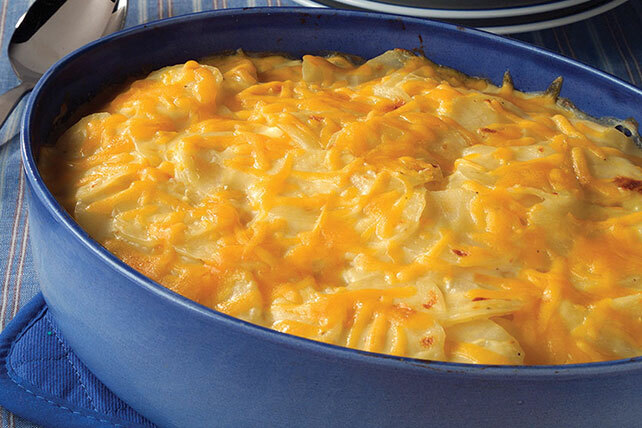 The layers of cheesy, warm potato slices in our Easy Potatoes au Gratin recipe are sure to please. Melt butter in medium saucepan on medium heat. Blend in flour, mustard and pepper; cook and stir 1 min. Gradually add milk, stirring until well blended; cook 3 to 5 min. until thickened, stirring constantly. Add 1-1/2 cups cheese and onions; cook 2 to 3 min. until cheese is melted, stirring frequently. Layer potatoes and cheese sauce alternately in 2-qt. casserole sprayed with cooking spray, ending with cheese sauce. Bake 1-1/4 hours or until potatoes are tender. Sprinkle with remaining cheese; bake 5 min. or until melted. Enjoy a serving of this classic side dish as part of a special-occasion meal. Prepare using your favorite KRAFT Shredded Cheese.